Big Sky Basketball: Could Portland State Win the Big Sky? Recently we looked at who might be the third best team in the Big Sky, considering for the sake of the argument that Weber State and Montana would be 1-2. In the post, I consider Portland State perhaps the favorite to be 3rd. 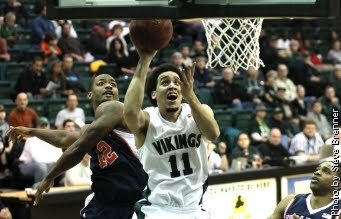 The Portland State Vikings will win the Big Sky championship this year in men's basketball. Yes those Vikings who play in a clean, sparkling, but awfully small arena, the Stott Center, which is seldom filled, but as noted, has the best band of any school in the country, with the band having an average of what I would guess 50 years old. - Coach Tyler Geving may someday be a very good coach, but he is not there yet. He is only 38, and after two seasons (albeit marred by some messes left by Ken Bone), there has been one thing about his resume that has stood out - PSU has been terrible defensively. Two years ago they had an AdjD of 112.4 (meaning opponents scored 112.4 points per 100 possessions against the Vikings), which was 338th in the country. Last year, they were down to 113.8, which ranked 334th in the NCAA. I don't care what league you are in, that will not get it done. They need to emphasize defense, and Geving hasn't shown yet that he can do that. - They don't have a ton of experienced depth. Charles Odum and Chehales Tapscott are their senior leaders. Michael Harthun and Brandon Cataldo are talented but it's tough to say how good they will be. Lateef McMullan looks like he will be a solid contributor coming in as a JUCO. But what will their depth look like? I'm not sure. - I think Weber State is actually going to be very good this year. Craw says it's "easy to win the Big Sky," but I don't think it will be easy at all to beat Weber State this year. They will be deep at all positions, they have great shooters, and they have an excellent coach in Randy Rahe. To top it off, you know they will be hungry after their preseason top ranking in the Big Sky was derailed by the injury to Damian Lillard. He will be back, and they will be good. What are all of your thoughts? Does Portland State really have a chance to win the Big Sky?